Those who fear your guns do so because they are guilty of things for which they should be shot. As it was fried so shall it be. 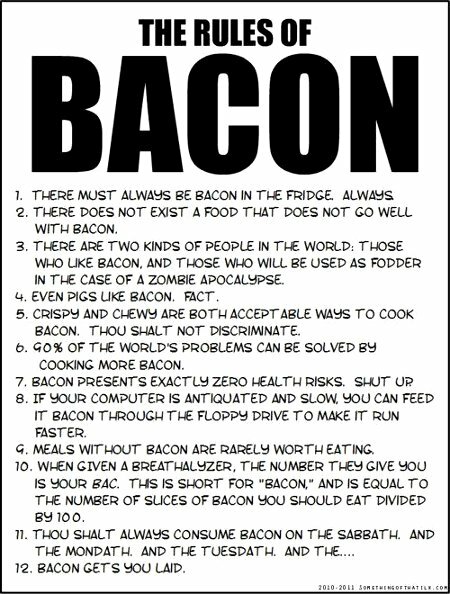 The rules of bacon must be obeyed. And yes, Ladies; rule 12 is incontrovertible. Properly used bacon will get you laid, especially during the Holidays. This entry was posted on Monday, October 17th, 2011 at 8:30 am and is filed under Food & Drink, Humor. You can leave a response, or trackback from your own site.